Like most folks in the South, I grew up eating grits for breakfast. My grandmother served them on a regular basis – savory, salty, buttery grits. Usually instant. If it was a special day, there was a slice of American cheese on top. I loved them. I still do. However, not until I moved to Northwest Florida did I discover that grits are not just for breakfast. No, indeed. In Pensacola and all along the Gulf Coast, grits are a common side dish with seafood. American cheese is the most mundane thing you will find added to grits. Here, grits are an art. A few years back, I went to a wedding reception that had a grits bar with a buffet of add-ins like bacon, various cheeses, shrimp and scallions. The grits were served in cocktail glasses. Fancy! Pensacola takes its grits quite seriously. Restaurants here specialize in making the corny Southern staple something truly exceptional. Here are five local restaurants where grits are among the stars of the menu. Here are five of my favorites. These are NOT your grandma’s grits. If you have only ever heard one place in Pensacola that’s known for grits, it’s probably the Fish House. The restaurant’s signature dish, Grits A Ya Ya, includes grits with smoked Gouda cheese topped with spicy jumbo shrimp and sautéed spinach and Portobello mushrooms, along Applewood-smoked bacon, garlic, shallots and cream. The Fish House includes the Grits A Ya Ya entrée at lunch, dinner and Sunday brunch. It also offers simple smoked Gouda grits as a side. 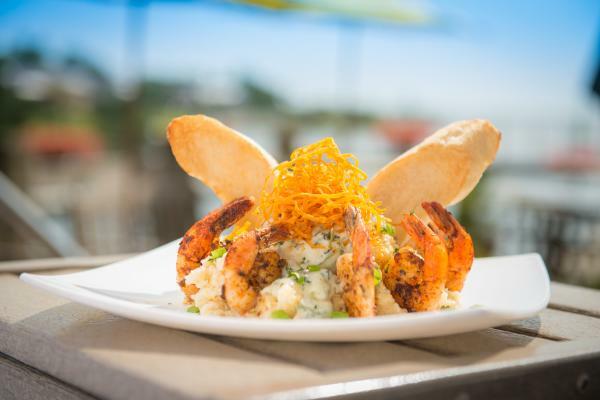 In Perdido Key, Fisherman’s Corner is the destination for excellent grits. Their menu features a shrimp and grits entrée that really stands out. The shrimp are breaded in Panko crumbs and deep fried served with stone-ground Gouda grits in a Creole sauce and spicy or mild sausage. This dish is a mainstay on the Fisherman’s Corner dinner and brunch menu. Gouda grits are also served as a side. The restaurant at the Pensacola Beach Hilton, H2O, bills itself as Cajun/Asian fusion. I’m guessing their shrimp and grits dish falls under the Cajun part. This dish, which uses locally milled stone ground yellow grits from C&D Mill near Pensacola, includes fresh gulf shrimp, andouille sausage, peppers and onions, all topped with fried egg. H2O offers this entrée all day. This restaurant is a Pensacola institution. For a generation, Skopelos overlooked Pensacola Bay from Scenic Highway. It was famous for its view as well as it’s fare, hosting at least one president. That location closed, but Chef Gus Silivos revived his famed eatery in 2016 at New World Landing in downtown Pensacola. Skopelos’ Sunday brunch includes Gulf Coast Shrimp and Grits, which is Cajun-seared shrimp over creamy cheese grits, with Tasso ham gravy, peppers and what the menu describes as “sizzled” greens and tomatoes. While grits aren’t just for breakfast anymore you can still eat them for breakfast. 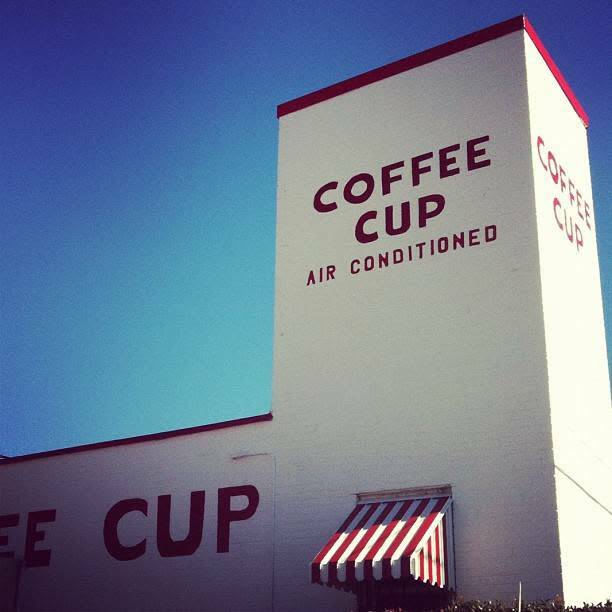 The Coffee Cup, as traditional a diner as you will find in Pensacola, is a locals’ destination of choice. Their menu proudly proclaims, “No Grits – No Glory.” While they do serve plain, simple, unadulterated grits as a side item, the Coffee Cup also offers Nassau Grits – a Southern tradition that includes bacon, ham, onions, green peppers and tomatoes. YUM! 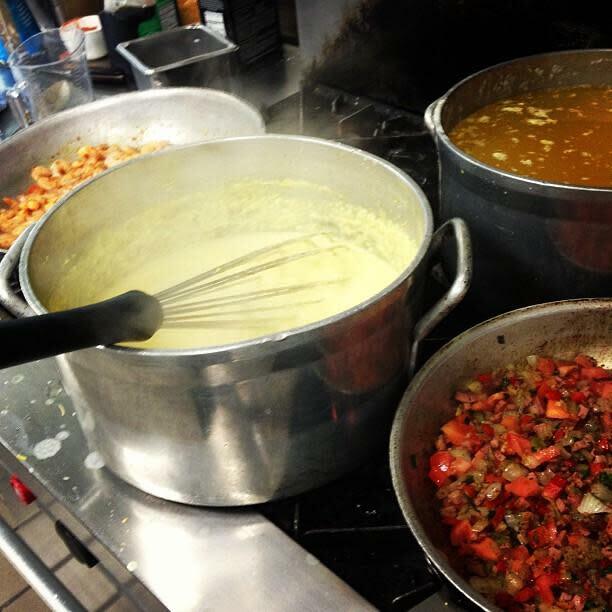 Have a favorite grits dish in the Pensacola area or know of a delicious way to make them? Leave us a comment below!